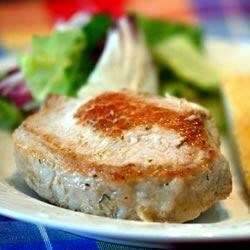 "Very easy recipe for tasty pork chops stuffed with bread crumbs, onion, parsley, spices and simmered in a beef broth." This was delicious. The only change I made was adding dried cranberries to stuffing mix. It went great served with garlic mashed potatoes. Will definately make this one again.